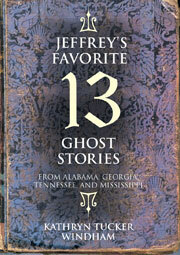 Eby notes many schools assign Windham’s first series of ghost stories, 13 Alabama Ghosts and Jeffrey, as required reading. “What Windham recognized is that all history is made of ghost stories, whether we choose to believe them or not,” Eby writes. Windham’s ghosts included victims of racial hatred, the Civil War, and accidents, such as the sinking of the steamboat Eliza Battle in the Tombigbee River. In Windham’s new book, She: The Old Woman Who Took Over My Life, the author departs from ghost stories to tell of more personal experience. Windham describes how she woke up one day to find that she had an unwanted houseguest, an old woman who had suddenly moved into her home and was taking over her life. The author refers to this interloper simply as She, and here the reader has been invited into the lively colloquy between Windham –whose spirit has not changed — and her own alter ego, as Windham moves haltingly toward her earthly end. She will leave you laughing and crying, but also grateful and hopeful. 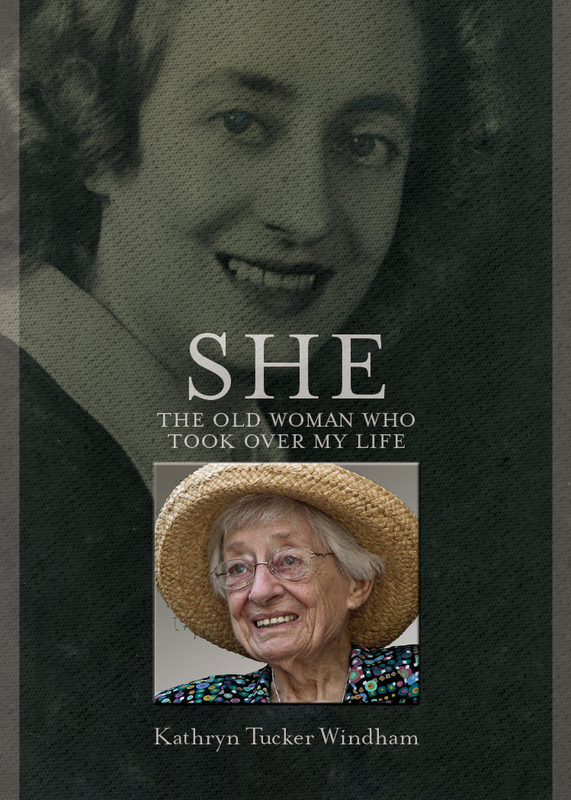 She: The Old Woman Who Took Over My Life by Kathryn Tucker Windham, is available in hardcover and ebook formats direct from NewSouth Books, Amazon.com, or your favorite bookstore. 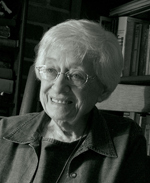 Colleagues of Kathryn Tucker Windham, who died this past weekend at the age of 93, remember her as a writer, storyteller, and mentor. On NPR’s All Things Considered program, reporter Debbie Elliott recalled meeting Windham while in college, and many years later how Elliott brought her children to Windham’s home and attended Windham’s induction into the Alabama Academy of Honor. Windham had contributed to NPR for over thirty years. Not quite five feet tall, stooped but raising her head to look the audience in the eye, she admonished introducers and audiences alike. Emcees citing anything more than her name, hometown, and occupation — “storyteller” — received curt reprimands. Audiences expecting “sugar and spice” were often shocked by her earthiness. One day in private conversation, I made the mistake of including her among “sweet little old ladies” of my acquaintance. She arched a wicked eyebrow and shot back, “Don’t you call me ‘sweet!’” Her thin voice and halting delivery could not hide a ton of heart, and that’s why audiences coast-to-coast filled her venues beyond capacity and sent her off-stage with standing ovations. Finally, Auburn University journalism professor Ed Williams shared a special web page commemorating his Newswriting Class’s trip to visit Windham in November 2009. Windham spoke with the class about her career as a newspaper reporter, and also led the students in a rousing rendition of the Auburn University fight song, played in inimitable Kathryn Tucker Windham style on a comb. You can visit the page for photographs and video from the visit. Kathryn Tucker Windham’s latest book was her memoir, Spit, Scarey Ann, and Sweat Bees. Information about a memorial will be forthcoming. 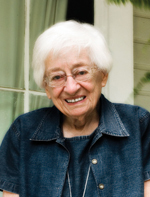 We invite anyone with a story to share about Mrs. Windham to leave a comment below or on the NewSouth Books Facebook page, and help us remember our friend and author. In an essay in her 1996 book, Twice Blessed, Kathryn Tucker Windham tells how she got started taking pictures as a child in Thomasville, Alabama. She got up before daylight one day in the summer of 1930 to be first in line at the People’s Drug Company to receive one of the half-million Brownie cameras that Eastman Kodak was giving away to twelve-year-olds for the company’s fiftieth anniversary. Her conscience, she wrote, always troubled her that she never properly thanked Kodak for that first camera. Over the years her cameras have included a Speed Graphic, a Yashica, a Cannon, and a Pentax. But the Brownie was the beginning, and this book includes several images (“First Airplane Ride,” “Basket Maker,” “Uncle Hiram Davis,” and “Woman With Spinning Wheel”) made with that camera, a git that led to her life-long interest in photography. 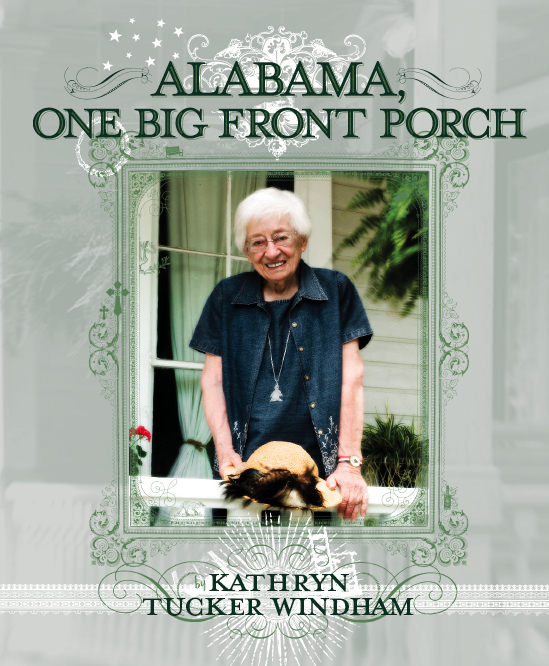 We at NewSouth Books were saddened at the passing of our friend and author Kathryn Tucker Windham, who died at her home in Selma yesterday. 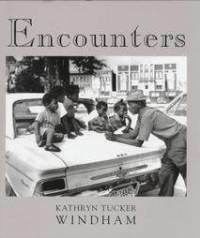 NewSouth enjoyed sharing a number of occasions with Mrs. Windham, remembered in the Kathryn Tucker Windham section of the NewSouth Books blog. 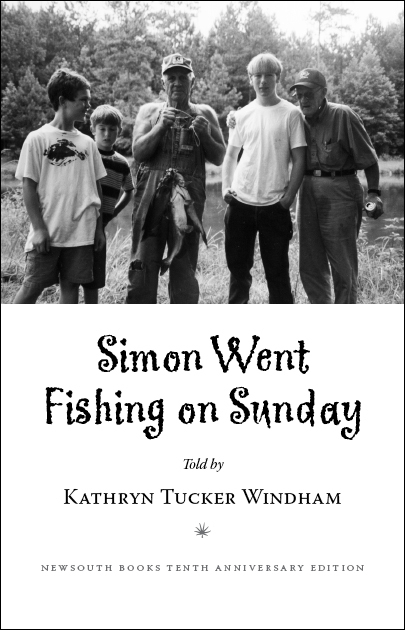 Kathryn Tucker Windham’s books available from NewSouth include Jeffrey’s Favorite 13 Ghost Stories, Ernest’s Gift, Alabama, One Big Front Porch, Spit, Scarey Ann, and Sweat Bees, and Simon Went Fishing on Sunday. We join with the Alabama community in fondly remembering Mrs. Windham. When Auburn University journalism students visited celebrated Alabama author and storyteller Kathryn Tucker Windham’s Selma home late last week, they probably never expected to hear the Auburn fight song played on a comb. 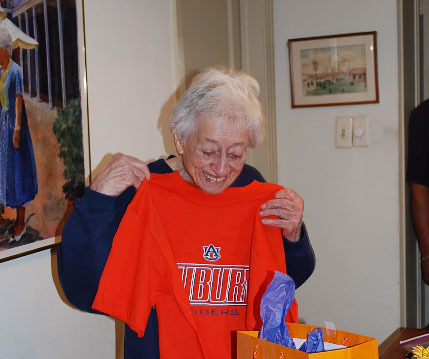 The students, who had read Mrs. Windham’s journalism memoir Odd-Egg Editor in Professor Ed Williams’ Newswriting class, presented Mrs. Windham with an Auburn T-shirt and were rewarded with a rousing “War Eagle!” in return. Mrs. Windham formerly worked as a reporter for the Alabama Journal in Montgomery, the Birmingham News, and the Selma Times-Journal, and she spoke with the students about her newspaper experiences, and answered their questions about journalism and storytelling. Both the interviewer and the interviewees became the story, as a Selma Times-Journal reporter arrived to document the visit. You can see photographs from Kathryn Tucker Windham’s visit with the students at the NewSouth Books Facebook page. You can also watch a video of Kathryn Tucker Windham teaching the students to play the Auburn University fight song on a comb. NewSouth Books recently published Kathyrn Tucker Windham’s latest book, the memoir Spit Scarey Ann and Sweat Bees: One Thing Leads to Another. Also available, Alabama, One Big Front Porch and Jeffrey’s Favorite 13 Ghost Stories. You are currently browsing the archives for the Kathryn Tucker Windham category.